As a native to London I have been exposed to various forms of music from an early age. From an early age I was being tutored by renowned saxophonist, Mornington Lockett. Whilst being a student of Mornington I performed with Lockett on many occasions including the Bulls Head, Thames Jazz festival and various venues in London. I also attended the Junior Jazz group at the Royal Academy of Music every Saturday where I gained a wealth of knowledge and experience under Nick Smart. With this group I played at venues including Pizza Express Jazz club (Dean Street) and Ronnie Scott’s. I then became lead alto in ‘The Jazz Funk Collective’, touring with them for three years around London and Ireland performing at venues such as The Blue Note, The Boom Boom Room and Galway Jazz club. I achieved a B.Mus. 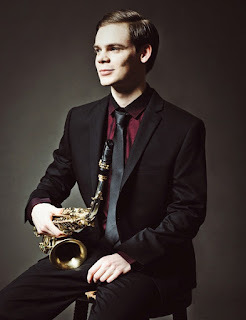 Hon Jazz performance degree from a world class London conservatory in 2012 studying for four years under renowned musicians including: Russell Van Den Berg, Jason Yard, Mark Lockhart, Simon Purcell. World famous Jazz master Jean Toussaint (Art Blakey) decided to mentor me for 2 years post graduation (2012/13). I released my first album ‘Next Beginning’ in November 2014 on the renowned F-IRE Label gaining critical acclaim, in particular from the National Guardian,’ His assurance and inventiveness are impressive at any tempo’ and Jazzwise Magazine. I have toured England, Wales and Scotland performing music from my album. A quote from a recent tour – ‘Eagles is one of The UK’s best contemporary saxmen’ – Bebop Spoken Here. I have performed at some of London’s best venues with my band such as: Pizza Express Jazz club – Soho a number of times, The Queen Elizabeth Hall – Southbank, The Clore Ball Room – Royal Festival Hall, The Spice of Live, The London Jazz festival three times. I am active on the UK music scene performing in many different bands such as Nomad Soul Collective of which we performed for SERIOUS at this years London Jazz Festival, Emeka Presents – Kalakuta, The Philip Clouts Quartet of which we have just completed a very successful album release UK tour, a quote about myself from Philip’s album – ‘…his deftly swerving post – bop inventiveness illuminates the initially languid Dreamy Driving…’ – John Fordham The National Guardian. Samuel is currently preparing to release his 2nd album in early 2017 on Whirlwind Records. Since the turn of the century, the Miami-native has made indelible imprints on the modern jazz scene playing with such titans as Roy Haynes, Dave Douglas and Jeff "Tain" Waits and reinvigorating the genre with his own band Twi-Life. Beginning with his 2001 debut, At Last (Fresh Sounds/New Talent), he's also been steadily building an impressive body of work. Last year Marcus appeared on Blue Note/Revive's acclaimed statement of purpose, Supreme Sonacy Vol. 1, on which he and singer Christie Dashiell delivered a spellbinding makeover of Janet Jackson's 1986 quiet-storm classic, "Let's Wait Awhile." The New York Times review singled out the track, writing that it "approaches the high bar for simmering R&B covers set by the Robert Glasper Experiment." Nihil Novi picks up some of the sonic cues from Supreme Sonacy, but with production help from Ndegeocello, Strickland paints an even more expansive musical canvas. The latest incarnation of Twi-Life is the centerpiece: trumpeter Keyon Harrold (known for his work with such R&B and hip-hop artists as D'Angelo, Erykah Badu, Jay-Z and Common), bassist Kyle Miles, drummer Charles Haynes, organist Mitch Henry, and keyboardist Masayuki Hirano. Nihil Novi also includes appearances from singer Jean Baylor, bassists Pino Palladino and Ndegeocello, keyboardist James Francies, drummer Chris Dave, guitarist Chris Bruce, and pianist and fellow Blue Note artist Robert Glasper. Consisting entirely of original songs, Nihil Novi was born of Strickland's passion for DJ beat making, which has shaped both the way he composes and how he improvises. It also inspired him to recruit Ndegeocello as the album's producer. "Because of all the layers and textures involved, I wanted someone who was very experienced at producing and creating this kind of music," Marcus explains. "Meshell is genre-less; she doesn't go by genres. She goes by who she is as a person. And that's exactly what I'm doing. I'm not interested in affixing myself to a particular genre; I want to express who I am musically as a person."